The first official residence built for North Carolina's governor was Tryon Palace in New Bern. Completed in 1770 as a home for royal governor William Tryon, and serving as the official seat of government, the structure was built largely with money accrued through taxation of the colony. The turmoil of the Revolutionary War - along with mounting demands for a more geographically centered location - prompted the General Assembly to move the capital from coastal New Bern in 1778. The legislature met in various towns throughout the state until 1792, when land was purchased from Col. Joel Lane, and Raleigh was established as the permanent capital of North Carolina. There have been three official governors' residences in Raleigh. The first, at the corner of Fayetteville and Hargett Streets, was a two-story frame residence purchased in 1797. By 1810 the structure had proved inadequate, and plans were drawn for a more suitable dwelling. A large brick house with elaborate white columns became the second official residence in 1816. The house, located at the end of Fayetteville Street (the present location of Memorial Auditorium), was built from a design by architect James Calder of Washington, North Carolina. Lack of funds prohibited regular maintenance with only minimal repairs made over the years. From the burning of the State House in 1831 to the completion of the present Capitol in 1840, the governor's house also served as the meeting place for certain sessions of the General Assembly. Civil War Gov. Zebulon Vance’s brief stay (1862-1865) in the house was followed by Union Gen. William T. Sherman who used the structure as his headquarters. After the War ended the state decided to abandon this long-neglected building as the official executive residence. 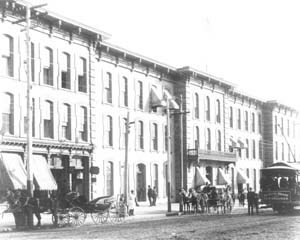 From 1865 to 1891 North Carolina governors had to rent their own homes in Raleigh, or stay at the Yarborough House on Fayetteville Street. Under Governor Jarvis's prompting, the legislature passed a bill in 1883 authorizing the construction of Raleigh's third official residence on Burke Square, providing for its major furnishings, and requiring that the governor occupy the new dwelling. The governor and Council of State were directed to use prison labor and building materials for construction as cost saving measures. Samuel Sloan, of Philadelphia, and his assistant, Aldophus Gustavus Bauer, were chosen as architects. Sloan arrived in Raleigh with his designs for the grand structure in April 1883 and work was begun in the mild weather of early summer. Unfortunately, Sloan died in 1885, six years before the completion of the house. Bauer assumed full responsibility for the mansion’s completion. He remained in North Carolina, eventually becoming one of the state's most important nineteenth-century architects. Inmate construction of the mansion was supervised by the warden of the prison, Col. William J. Hicks. Whenever possible, building materials were acquired from within the state. The bricks were made from Wake County clay and molded by prison labor. Many of these bricks, particularly in the sidewalks surrounding the house, still bear the inscribed names of the men who made them. The sandstone trim came from Anson County. The marble steps in front (later moved to the north side) came from Cherokee County, and oak and heart pine were shipped from all across North Carolina for use in building the house. 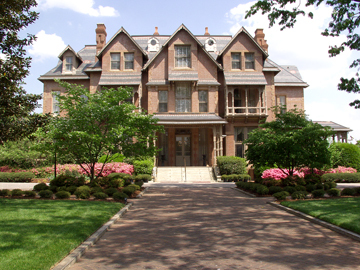 The Executive Mansion was completed in 1891 and remains one of the state's finest examples of the Queen Anne style of Victorian architecture. Its many attractive features include a steeply pitched gable, richly colored textural surfaces, and elaborate turned woodwork. The first occupant of the house was Gov. Daniel Fowle, who stayed from January 5, 1891, until his death on April 7, 1891. It has seen continuous use throughout the twentieth century with each successive Governor and First Family. In 1970, the mansion was placed on the National Register of Historic Places. In 1973, the North Carolina General Assembly established the Executive Mansion Fine Arts Committee. The Committee is tasked with preserving and maintaining the mansion as a unique architectural treasure – a historic house and home. They also are responsible for acquiring historical and artistic objects for use in the mansion. They work with the First Family and the Secretary of Cultural Resources to ensure the continued use of this historic treasure by and for the people of North Carolina. Governor Roy Cooper is the thirtieth governor to live in the Mansion. He is the seventieth person to hold this office in North Carolina since the end of the American Revolution. For information on visiting or touring the Executive Mansion, contact the Capital Area Visitor Center.